Discover endless possibilities - unique entertainment, activities and innovative concepts. Royal Caribbean is one of the world's largest cruise lines with a fleet of 25 innovative cruise ships. Designed for 'WOW', Royal Caribbean embodies fun with a variety of unique entertainment options and innovative facilities. Renowned for its at-sea firsts, Royal Caribbean took cruising to the next level on board the revolutionary Oasis class, with the introduction of robot bartenders, the 'RipCord iFly' skydiving simulator, the North Star observation capsule, the FlowRider surf simulator and the world's first on board floor-to-ceiling Virtual Balconies. Kids and teenagers can enjoy a myriad of fun activities on board Royal Caribbean, from hanging out with their favorite movie characters at the DreamWorks Experience to interacting with others at the Adventure Ocean youth program. More than an adventure seeker's paradise, you can also experience the ultimate relaxation on board Royal Caribbean, whether you would be found lounging by the pool or pampering yourself at the spa. Discover all this and hundreds of spectacular destinations in Alaska, the Caribbean and Europe on board the Oasis of the Seas, Allure of the Seas, Anthem of the Seas and more. Experience exotic ports and onboard thrills with Adventure of the Seas! This Royal Caribbean ship is perfect for families, adventure seekers, and couples looking for an action-packed vacation. Brilliance of the Seas is the perfect ship for adventurous travelers looking for an action-packed vacation. With the activities of a large ship but the intimacy of a smaller vessel, Brilliance of the Seas provides the best of both worlds. Enjoy a fun-filled vacation on Enchantment of the Seas. Onboard activities include a bungee trampoline, an onboard water park, suspension bridges, and a variety of onboard restaurants, bars and lounges. Journey around the world with Explorer of the Seas. Whether you're looking for an adventurous journey to exotic destinations, or a relaxing vacation on a tropical island, Explorer of the Seas is the perfect ship to take you there. The Freedom of the Seas offers everything you could desire to fulfill your dream cruise vacation, from exquisite cuisine, a wide range of leisure activities and an indulgent wellness program. The Grandeur of the Seas offers all amenities you would expect from a modern cruise liner. A spa, an athletic track and different pools will please every guest aboard. The independence of the Seas is one of the most innovative cruise ships at sea. The exciting ship’s 15 decks leave nothing to be desired – from numerous sports and entertainment facilities to culinary delights, all your wishes will be fulfilled. Enjoy island hopping in the tropical Caribbean or sunbathing in the beautiful Mediterranean with Jewel of the Seas. Spectacular entertainment and action-packed itineraries will keep the whole family entertained. A popular ship for families, Liberty of the Seas delivers fun-filled itineraries to sunny destinations in the Caribbean. With twelve onboard restaurants, nonstop entertainment and countless onboard activities, you'll feel spoiled for choice on this high-end ship. Royal Caribben's Majesty of the Seas offers popular sailings in unmatched comfort. Expect crowd-pleasing restaurants and popular activities in an environment that is both comfortable and relaxed. Mariner of the Seas is a versatile, family-friendly cruise ship that sails everywhere from Miami to Malaysia. Whether you're island-hopping in the Caribbean or sailing to another hemisphere, you can enjoy an action-packed adventure with Mariner of the Seas. Endless activities await onboard the Navigator of the Seas. This family-friendly ship is packed with enough games, shopping, and sports to keep the whole family entertained. One of the world's largest cruise ships, Oasis of the Seas is perfect for an action-packed vacation to a tropical location. Its onboard rock climbing wall, video game arcade and surf simulator make it perfect for families with kids. Radiance of the Seas is perfect for the ultimate relaxing or adventurous cruise vacation. Indulge in the lavish Italian specialty restaurant, Giovanni’s, or try your luck at the thrilling Casino Royal. The family-friendly Rhapsody of the Seas sails popular itineraries in the Mediterranean and Caribbean. The ship's numerous sun lounges and pools offer plenty of opportunity to work on your tan on a sunny island vacation. Explore some of the world's most exotic destinations on board the Serenade of the Seas. Sail away in maximum comfort. Enjoy the diverse entertainment and wellness programs onboard. Experience your dream vacation on Vision of the Seas. Whether you're looking for a family-friendly itinerary with lots of activities to keep you occupied, or a relaxing retreat with lots of sun and spa, Vision of the Seas has it all. Voyager of the Seas is the perfect ship for travelers looking to explore exotic destinations from the comfort of a cruise ship. Calls in unique ports in Asia, Australia and the South Pacific make for an adventurous voyage, and a variety of onboard activities are sure to keep the whole family entertained. Enjoy a state-of-the-art cruise experience onboard Quantum of the Seas. A modern ship with all the bells and whistles, Quantum of the Seas is defined by innovation and fun. The Anthem of the Seas has been setting standards in cruise excellence since 2015 with innovations such as the SeaPlex, FlowRider and North Star observation capsule. A Quantum class ship, Ovation of the Seas is one of the largest cruise ships in the world. Enjoy action-packed itineraries, innovative entertainment options, and a wide variety of dining options on board. There is always something new to discover on board Harmony of the Seas. Enjoy innovative facilities and amenities, including the world’s first virtual balconies, skydiving simulator and robot bartenders. Voted "best overall cruise ship" in 2013 and 2014, Allure of the Seas is not just one of the biggest cruise ships at sea, it's one of the most popular. Enjoy a sunny Caribbean vacation on this all-American ocean liner. The Empress of the Seas provides comfort and entertainment at the highest level. Whether you are longing for a relaxing or adventure-driven cruise vacation, everything is possible on board the Empress of the Seas. The Symphony of the Seas is a luxurious ship that is part of the Oasis fleet. Similarly to its sister ships, the Symphony of the Seas has numerous alternative cabins that cater to the needs of all customers. On board the ship there is a vast amount of different entertainment and culinary options which is sure to captivate all cruise-goers. With her launch in June 2019, Spectrum of the Seas will be the biggest ship to sail the Asia-Pacific region. East meets West and old meets new on this unique, Quantum Ultra-Class ship! The Miami-based world’s largest cruise line is known for its unforgettable cruise destinations and innovation at the sea. Royal Caribbean has brought a revolution to sea by continuously redefining what a real cruising can be. With 269 destinations across 77 countries, thousands of passengers can certainly visit all corners of the world. Dream vacations start with Royal Caribbean cruise! Whether you are planning a short weekend getaway or a romantic cruise to the Bahamas, you can expect a high level of customer service. Want to relax and be pampered? Treat yourself to a luxurious stay in a royal suite class cabin with brilliant ocean views. 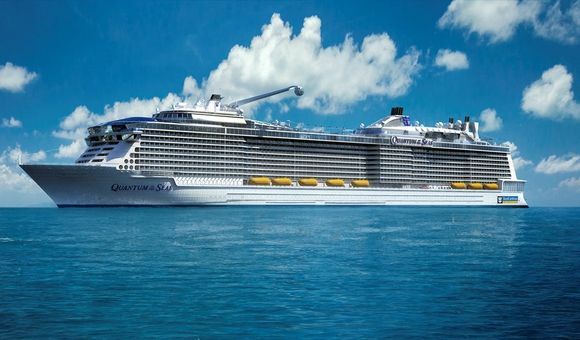 Royal Caribbean makes a point of offering a lot of opportunities to explore Caribbean Islands, sailing aboard the world’s largest cruise ship, Harmony of the Seas. Royal Caribbean cruise line also offers cruises to Alaska and Canada. Discover the very best of the Great Land, its wildlife and national parks. There are certain voyages that can be uniquely experienced with Royal Caribbean – beautiful Bahamas, geological wonderland Hawaii, exceptional cruise through the Panama Canal, perfect shore excursion of the Caribbean Sea and much more. No matter the type of cruise you choose, you will always find a full list of onboard activities, including first surf simulator at the sea, rock climbing, ice skating and mini-golf. For added adventure, try scuba diving program exclusively on Royal Caribbean. Find some time to unwind and visit Vitality Spa for a soothing relaxation for your body and mind. Experience the Thermal Suite and feel recharged with a restored sense of comfort. And when you need a break from all the activities, get a caffeine fix at Café Promenade. Should you wonder being in one of the majestic ships of Royal Caribbean fleet, it is easy! They all have the appellation “of the seas” in their name and an extensive selection of ships to choose from. Though it is far from home, you would love to discover the Caribbean? Royal Caribbean couldn’t make it easier for you by offering cruises from Florida with the innovative Independence of the Seas. The delightful Independence of the Seas or the marvelous Freedom of the Seas will be your best vessels for the well-deserved relaxing holiday thanks to their over 100 spa treatments available onboard. In case you are not impressed by ten-story tall Ultimate Abyss slide – the tallest slide at sea, visit an art gallery and attend a Broadway show. And all under the same roof – Harmony of the Seas is tailored made for you! Let the family be blessed by the enticing Empress of the Seas with its great diversity of dining venues and entertainment options for adults and children. If the enchantment is what you are looking for, the Anthem of the Seas will be breath-taking. Whether you are traveling alone or with your significant one, this ship will impress you by its awe-inspiring facilities. Its sister ship, Quantum of the Seas will astonish you with its magnificent design and its outstanding first-at-sea experiences even if you are a boat skeptic.